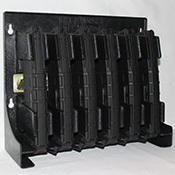 Mag Storage Solutions provides a universal storage solution for 30 round AR-15 magazines. Our product holds six 30 round AR-15 magazines at a time and can be mounted inside your gun safe, weapons room, or any area where you store and organize your magazines. Magazines snap easily in/out and remain firmly in place. Our magholder is Made in the USA and is compatible with most .223 and 5.56 caliber mags. Stop searching your drawers, cabinets and range bags for your mags!